This game is in the very, very early stages. Please understand that it is out there just to see if there is any/enough interest to incorporate it into the QuickSuite I am putting together that will have similar games for a very reasonable price in the Official App Catalog. 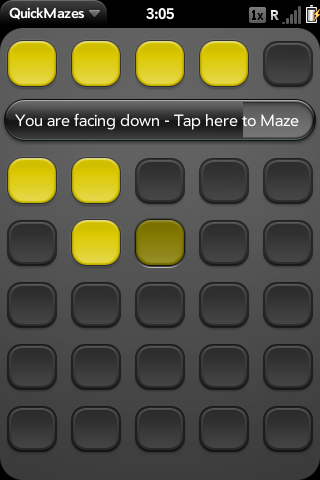 QuickMazes is a '3D' view of a maze that you swipe your finger to get through. 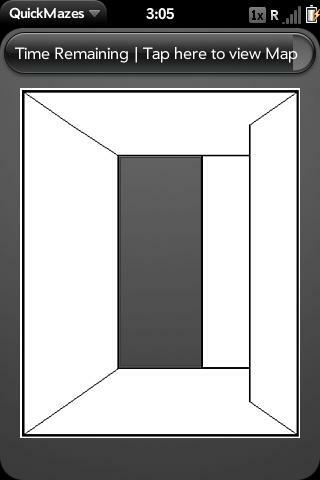 Swipe up to go straight, down to go back, and left or right to go that direction, respectively. You can tap the timer to see an aerial view of the maze (without walls) to see where you've been (lit) and where you are (dark lit). The timer in the map view tells you your orientation. 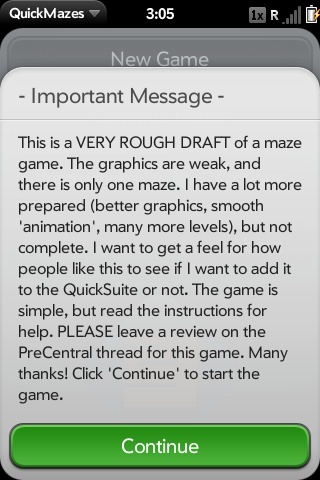 You will only be afforded 5 views at the map for each maze. If I have some interest, I will throw a few more mazes on here with the updated graphics.